There has been a ton to reflect on in the last two months. It was the first time Sprouting Chefs was back in the gardens cooking with kids in the summer since 2010 and to be honest, I was a mix of excited and scared which are both the same feeling funny enough. Excited to be fulfilling the part of our program that answers the question of “what to do in the summer with school gardens” and scared a bit wondering if I could pull it off again. All worthy thoughts looking back now. The camps filled up nicely with an age range of children from 7 years old to 13 years old in scattered weeks through the summer. We had access to use the Community Room at Lochdale Community School which had a lovely school garden I had planted out in the Spring of 2016 with the school. I was familiar with the space and a few of the kids too. A few goals of the Summer Cooking Camp: to harvest and cook with the food growing in the school garden, to highlight local seasonal ingredients available in BC, to teach at least 10 basic recipes to children that they can then use at home with their families, to instill a sense of confidence and empowerment within each child. From Asian Salad Rolls, Roasted Chicken (as seen in the photo above! ), Pastas, Salads, Wraps and Infused Waters, we did it all plus a few more depending on the group. Also new this year was taking the groups to Whole Food to learn how to shop on a budget. The older group, 10 to 13 yr olds, learned how to either work together in groups or shop individually with only $5 each to then create a recipe when they returned to camp. It was awesome to see the final creations which included: Tomato Lentil Soup, A Crostinni Hors D’Ouerve with Chicken Sausage, Avacado and Cheese, French Toast, and a Fruit Crisp too. It was great to have a handful of new volunteers and a couple of fabulous staff to help me manage the various degrees of organized chaos. Chase Ando and Valerie Song from AVA Gardens brought in their enthusasim, energy and passion for food during the week with the older kids. We all had a blast! In between all the camps, Sprouting Chefs was also funded to oversee and maintain the Forest Grove School Garden during the summer. Bursting with life at every turn, Garden Work Bees ranged in activities from watering, harvesting both crops and seeds, planting out more crops, composting and weeding. Families from the school’s Garden Club, Forest Grove Alumni and a handful of volunteers from BDO, a new corporate sponsor all came out throughout the summer. Many folks ask how to care for a school garden during the summer and what has been working really well for a handful of schools Sprouting Chefs oversees is a simple volunteer schedule that gets created just before school ends. Parents from the Garden Clubs are asked to sign up for a week to water and care for the garden. In the end, only about 9 families are needed and the families feel really good about caring for the garden and helping their community. What is needed to maintain a school garden in the summer: access to a hose and water source, someone coordinating the transition between the families usually via email, and a strong knowledge of what each garden space needs. Some of the Forest Grove Families took on more than 1 week, their dedication and commitment to the garden was that strong. Always in the back of my mind as the summer days passed was the fact the kids in the school would be back soon and to make sure there was something for them to discover and admire about what they had planted in the spring. Garlic was harvested in July and cured for the Fall Cooking Classes, the Labyrinth was redefined as the grass had grown in and the front garden area was thoroughly watered and weeded all ready for the kids to enjoy again. When it comes to fall and preparing for the new school year in the garden, the biggest crop and excitement is around our tomatillos. For the past few years now, the kids at Forest Grove have been learning about preserving and then selling Roasted Tomatillo Salsa at the school’s Christmas Craft Fair. Out of the sales and interest, the students then estimate how many more new crops to plant for the following year. Sadly, the Christmas Craft Fair is not going ahead this year so Garden Club will be creating the salsa to sell to the community in another way; either via the Burnaby Farmer’s Market or at the upcoming Fall Community Event we are creating with the school. The Fall Community Event will be a set of 6 in school Cooking Classes with the Intermediate students ending with a celebration where the school community and a few local community groups will come together for a lunch. Another exciting and new adventure for Sprouting Chefs as a pilot project that may become an event other schools can also create with our help. Teens these days can get a bad rap. I for one, as a mother of younger children, have the odd fear that my kids are going to grow up in world infused with social media mixed messages, over sexed marketing schemes and that whatever the Kardashins are doing is the trend. Sure the media tends to highlight the worst case scenarios. But what if we start a movement that changes things by highlighting all the teens that are setting out to “be the change they want the world to see”. One of my biggest pet peeves is also this “anti-bullying movement”. Sure this is a good thing to promote “anti-bullying” but we’re still using the word “bullying” and I would rather see a movement that focuses on Kindness, Compassion and Peace and the children who are examples of that. 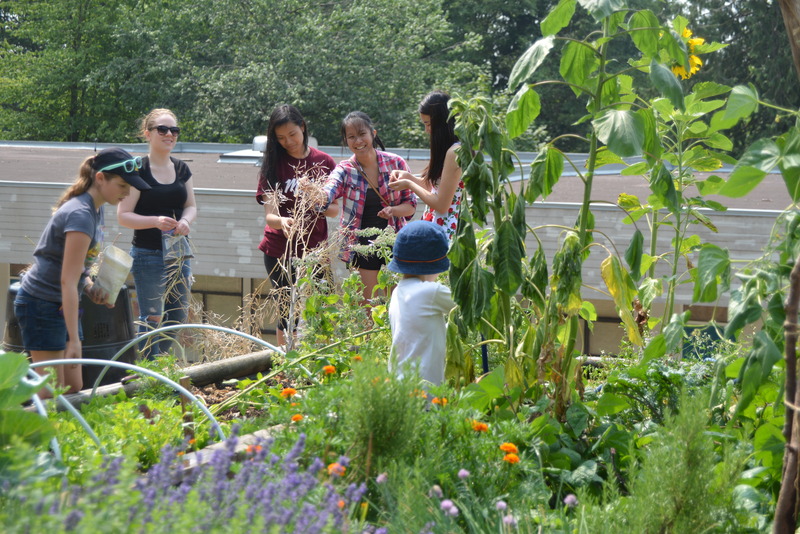 From the very beginning of the Forest Grove School Garden Project, I have felt that children learn more from other empowered youth and teens who are just slightly older than they are. The garden has allowed an opportunity to let the youth in our community shine. I have witnessed the power of influence when a 14 year old shows a 7 year old how to do something simple like use a drill. And when that 14 year old uses a drill to attach a sign of virtue on to a school garden with the words: “Patience”, “Trust”, “Compassion” or “Forgiveness”, well, you can only hope that some of these virtues seep into their consciousness. 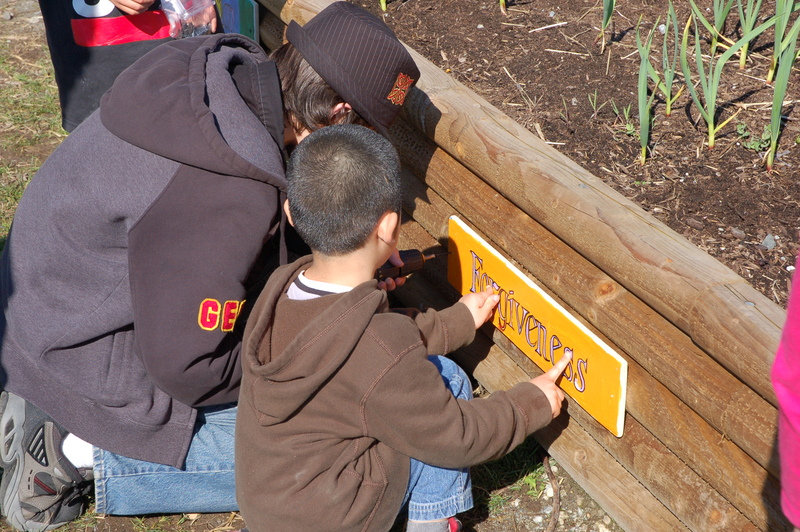 Although the Forest Grove School Garden is a project that takes place at an elementary school, I felt it was important to include other generations of students in the project. Not only can the lessons learned in the classroom transcend into nature’s outdoor classroom making them real and effective, there was also a need to include the rest of the school community to ensure the project was a success. If other community members were involved, especially those who were about to graduate from the school and go on to high school, there was less chance of vandalism because there was a sense of ownership and care over the project. Grade 7 students therefore were vital to the build of the school garden. 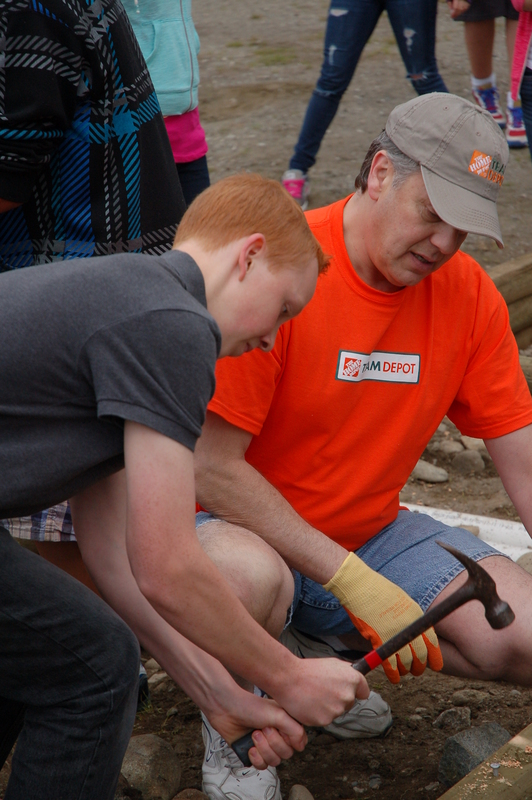 A Grade 7 student getting guidance from our friends at Home Depot who funded the school garden build at Forest Grove. The student featured in this photo has gone on to programs in the field of trades after his Grade 9 year and now is enjoying an apprenticeship with a construction company. Coincidence? Or did being a part of building the garden spark an interest in him? Once the garden was built, it was time for the parents and champions of the project to take a step back and hand over some responsibilities to the students themselves as well as reaching out to high school students who might be interested in helping sustain the garden; creating a bridge into the community via the garden. 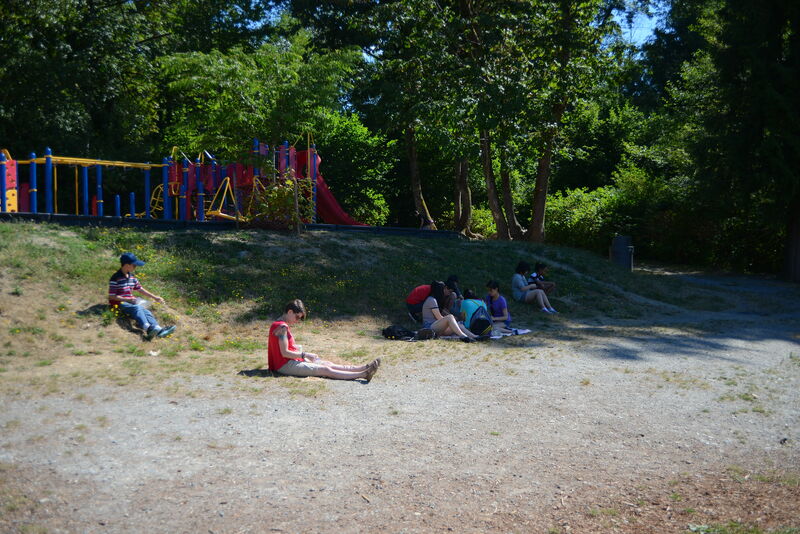 The answer was given to us in the form of an amazing group of teens called the Burnaby Youth Sustainability Network. 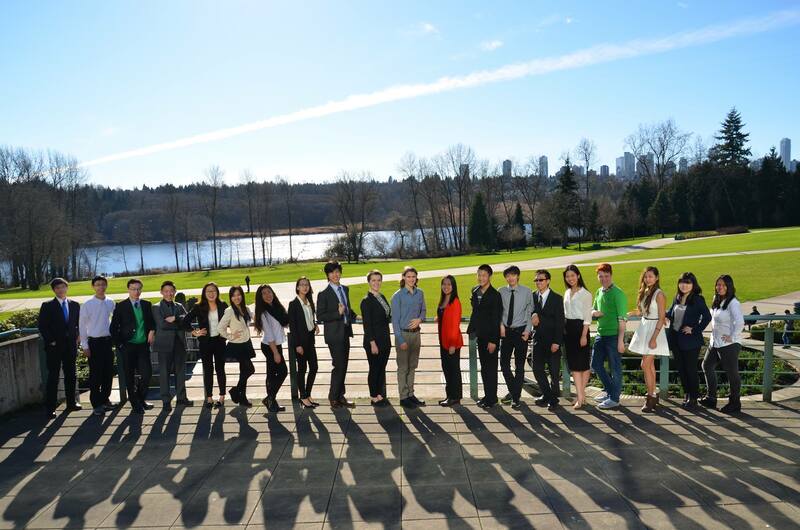 This is a group that was formed from the passion of two Grade 11 students in 2010. 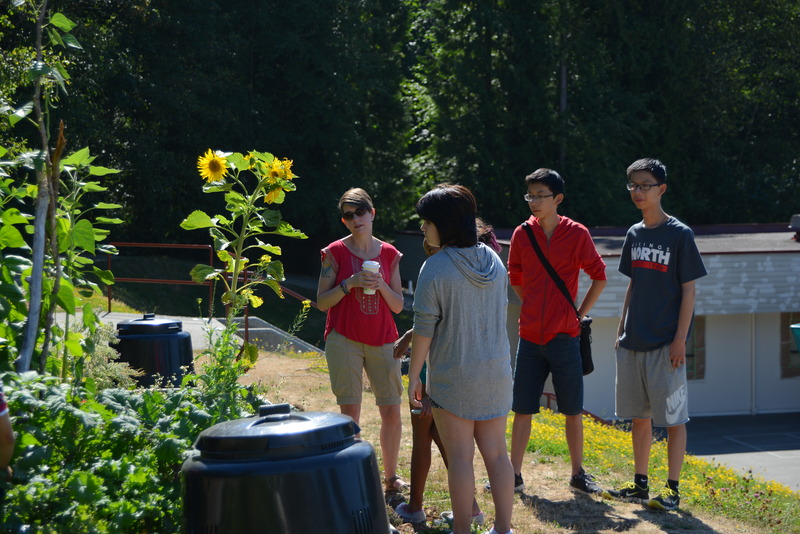 Every month the teens gather together students from all 7 local Burnaby high schools to discuss matters regarding: recycling, water conservation, sustainability, waste management and now, school gardens. They continued to expand this network by evolving a group in Ontario and now there is even a national network of youth for sustainability. They were and still are a natural fit to reach out to. Creating the After School Garden Club was the answer to several issues about sustaining a school garden. 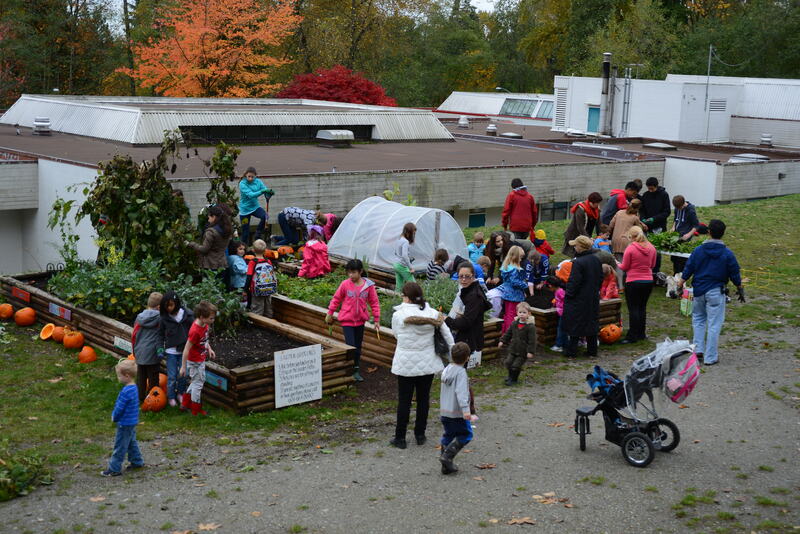 The Garden Club is a group that is made up of students within the school from K to Grade 7, (K to Gr. 2 students must come with a parent or guardian) to water, weed, harvest and maintain the garden space. Leading this group with various organic methods and principles, I placed myself in charge. But leading a group of sometimes 20 plus students on my own with a handful of parents can also be quite challenging. Enlisting the help of the teens was a natural answer. 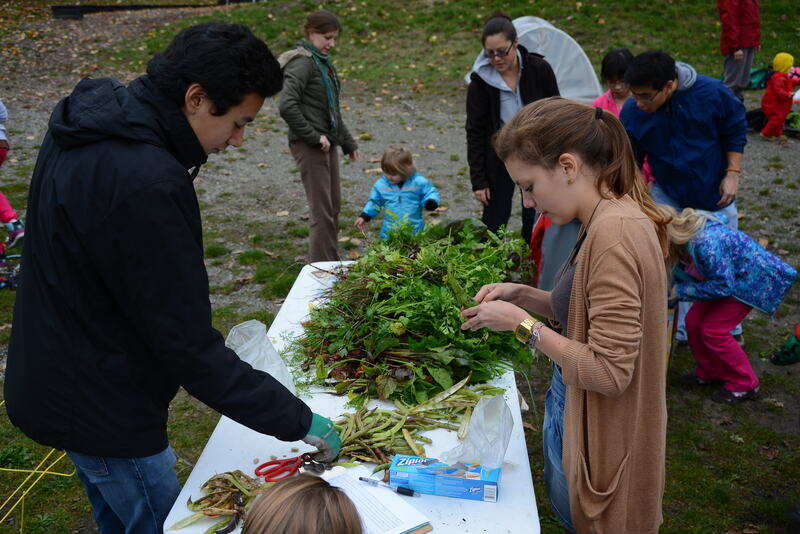 Teens are given some direction and then asked to help younger students with various duties around the garden like using clippers or cutting down big sunflower stalks in the fall. Watching them work together with the younger students is definitely a sight to behold. There is sometimes a bit of hesitation on both parts but after awhile, the groups find a flow that might only last a few minutes but a connection has been made. An Outdoor Education Program was another group that we reached out to who responded by helping us with our Fall Harvest and Clean Up. There must have been at least 20 students who came to help with this activity. Although this was an organized after school group lead by a teacher, they still came with enthusiastic hearts and genuinely wanted to help. Students from the Burnaby Mountain Secondary Outdoor Ed Club who happened to be international students this year as well, helping us out for our fall harvest event. Summertime is also a time during a school garden project that can be a challenge. Who will water the garden over the summer? What do you do with the food that has grown in the garden? This year like many other years before, I have led various Summer Work Bees with the school community. We have met on Wednesdays and Saturdays throughout the summer to tend to the garden space. We have also set up a watering schedule with the parents and families of the Garden Club. Having a list of emails collected from registration forms in the beginning of each year is quite valuable to continue to reach out to families throughout the whole year. What has been special about this year is that the leader of the BYSN reached out to me in June before school ended to ask if their group could help in any way. Facebook and social media have been our main lines of communication. If you are going to connect with teens, know how they communicate and social media is probably the main method, more so than emailing and second to texting. After reaching out to me via Facebook, I responded with the list of dates for each Summer Work Bee. A few days later, she let me know that after sending the dates out to her group, we now had teen volunteers for each date. Remember, these are teens who may be attending summer school during the summer, have social lives, are meant to be relaxing and lazing around pools but choose to volunteer their time…to garden! I had a few doubts but because we had already established a relationship with the group itself, seeing the first group of eager teens including the leader herself, for the first Summer Work Bee still warmed my heart. They genuinely want to help in some way even if it’s just watering, weeding, thinning out beets or harvesting kale seeds. I have had 10 different teens arrive on a Saturday morning in the summer from 5 different Burnaby high schools including Burnaby South which is at least 2 or 3 bus rides away from Forest Grove. Of course these Work Bees end up going quite quickly with all these extra hands. When there is time left after the “work” is completed, I encourage the teens to ask me questions regarding their own gardens and they do. We’ve discussed composting, what grows well in containers, what can grow all year round and what you should purchase as established plants. There is a genuine curiosity here. I guess my main intention as September creeps ever so close and some of these youth will also be heading off into universities is that this blog reaches them and they feel heard, seen and appreciated. I don’t always get the chance to properly thank them, honor them for what they do and most of all, encourage them not to stop caring for the world we live in, the lives they touch and the difference they are making. By showing up in life, showing up to volunteer with us and maybe only have a brief moment or two with a younger student, they too are planting seeds in the gardens but also in the minds of the younger kids they interact with. Seeds that might grow into an idea that helping the environment is a cool thing to do as is serving the community. So to Jennifer, Sofiya, Jacqueline, Tomas, Salina, Simon, Ariel, Alice, David, Todd, and numerous others who have shown up in our garden, expressed interest in changing the world, created some amazing events (Do It Green Conference. Check it out. All organized by youth, for youth. ), I see you, I honor you and I’m grateful for all you are doing.